This is a generally accepted opinion that women are more concerned about their clothing. However, this is only partially correct, as in reality men also prefer to choose qualitative and stylish clothing for any occasion. Bobby Jones is the famous designer, which is associated with the modern country club lifestyle and some applications of classic style. 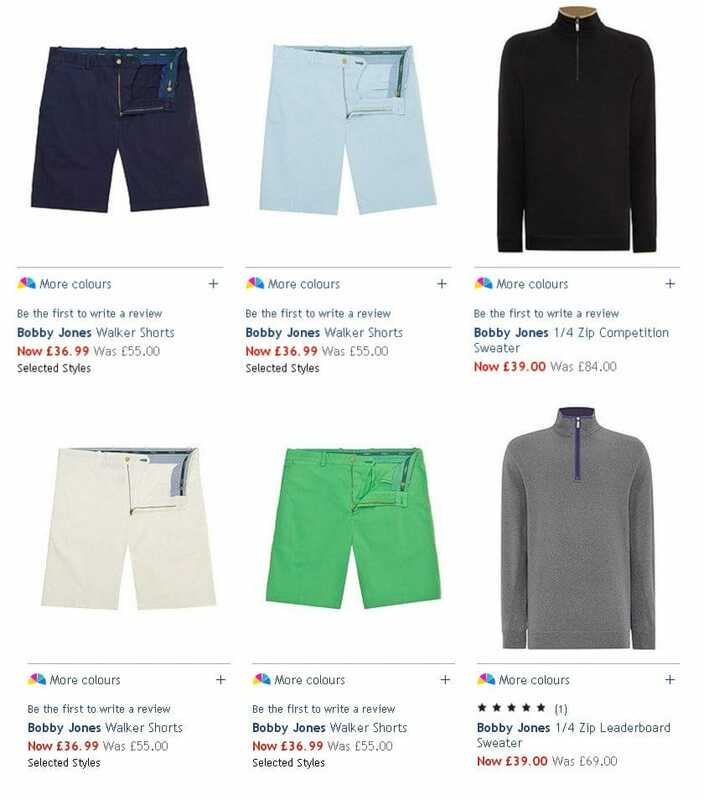 The collections by Bobby Jones are mostly for those men, who are self-assured, morally and physically strong, ready to reveal their natural power and confidence. Bobby Jones 1/4 Zip Competition Sweater is utterly simple, but stylish and comfortable. It could be easily introduced into any wardrobe and be worn with denim or sportive trousers. It has half zip collar stand. It is made of 100% Pima Cotton. For adding a warm layer to your casual outfit you could use the v neck vest top is made from 100% extrafine merino wool, which is extremely soft and warm. It could be worn over a golf or a t-shirt. The color of it is undemanding and at the same time is rather bright. Shorts are ideal for warm time of the year and thus classic lightweight flat fronted cotton shorts by Bobby Jones would be adored by any male. They are made with traditional zip fastening, there are four pockets and belt loops. The composition is 98% Cotton, 2% Spandex. For those, who prefer brighter colors, there is another option – garment dyed stretch twill shorts in orange color. Polo shirts are traditional and versatile. Classic looking polo with 3 button placket and Bobby Jones player embroider would become a bright note in your wardrobe for summer time. Worn with denim trousers, it would create a stylish casual outfit for any man. Supreme soft handle with moisture wicking technology. There is button fastening. There are more polo shirts available in various colors by Bobby Jones brand name.